Global Kung Fu Network News On November 6th 2018, President of the Russian Kung Fu Federation Rabadanov Magomedkamil and President of the Russian K9 Federation Zaur Abduragimov visited the teaching area of the Beijing Shaolin Wushu School and received warm reception from the leaders of the school. In order to welcome the guests, Beijing Shaolin Wushu School coaches and students presented wonderful martial show for the guests. With the magnificent background music, every student showed their power and spirit. The high-level skills of traditional martial arts were displayed to the fullest. The guests gave warm applause from time to time. After the performance, everyone took a group photo. 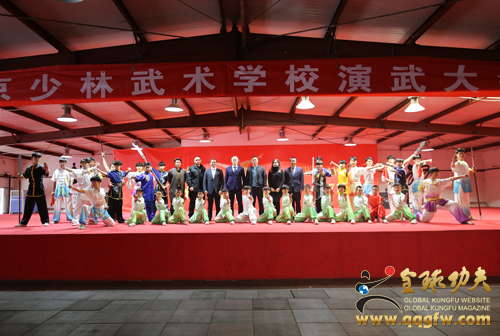 After performance, the leaders of the school took guests to visit the environment and education facilities of the Beijing Shaolin Wushu School, and introduced by detail the development history and development status of Beijing Shaolin Wushu School. Beijing Shaolin Wushu School was founded in 1991. It is the top ten Wushu schools in the country, and it is a martial arts special-purpose school that implements elementary school, junior high school and vocational high school education. At present, there are 12 domestic and abroad school branch , the total number of students in the school is nearly 10,000 and there are 1985 students in Beijing Changping Campus. The school has always adhered to the philosophy of “taking wushu as a feature and attaching importance to cultural teaching”, focusing on the school-running direction of “quality education and characteristic education”. It is oriented to national enrollment and has strong teaching staff. Among them, cultural teachers with middle and senior titles account for 45%, wushu coaches. They are all graduated sports colleges, among which 60% are outstanding Wushu graduates from famous universities such as Beijing Sports University and Capital Sports College. All courses are offered according to the national syllabus, strict teaching management, guaranteed teaching quality, and school culture achievements. In recent years, the undergraduate admission rate of high school graduates has reached 85%. Thousands of students have been admitted to major institutions of higher learning, and have sent a large number of outstanding talents to higher education institutions and social circles at domestic and abroad. The school's performance group participated in the closing ceremony of the 21st National Games, China's Million Children and Children's Fashion Exhibition, the Berlin China Culture Week in Germany, and the 2004-2006 three consecutive years of CCTV Spring Festival Gala, the 2008 Olympic Games torch relay, the opening and closing ceremonies of the Olympic Games, The opening ceremony of the Shanghai World Expo, Beijing Taiji and other large-scale events. In recent years, Beijing Shaolin Wushu School has established branch schools in Beijing, Shanghai, Nanjing, Shandong, Britain, Ukraine, Russia, South Korea and other places, and entered the road of group-based education with a high attitude. In the 28 years since the school was founded, it has been widely recognized by the higher-level leaders and the society. Since 2006, Beijing Shaolin Wushu School has won the “Top Ten Wushu Famous Schools, Beijing Wushu Traditional School, Beijing Taekwondo Traditional School, Beijing's most influential Schools, Beijing's highest satisfaction schools, Beijing Changping District civilized units, Beijing Changping District private education Jinxing unit, and other honorary titles. The clean and spacious campus, spacious and bright classrooms, fully functional practice halls, scientific and efficient training, refreshing spirit and fruitful educational achievements have made Rabadanov Magomedkamil and Zaur Abduragimov greatly appreciated.